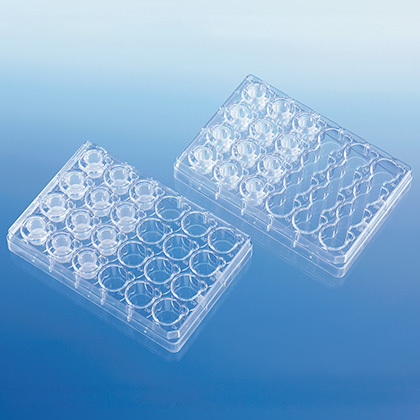 Product and ordering information for BRANDplates® Insert System Microplates: 24-well standard or 6-well specialized for co-culture, secretion & migration studies, 3-D cell culture, etc. ; available in non-treated or tissue culture (cellGrade™) surfaces; suitable for robotics/automation. 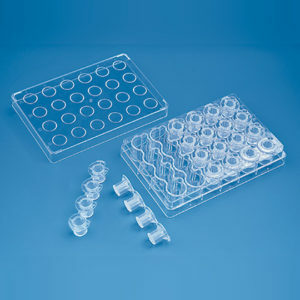 The BRANDplates® Insert System, co-developed with the Fraunhofer Society, is an innovative microplate system for cell culture applications such as co-culture, migration/invasion assays, and in vitro preparation of 3D tissue models. 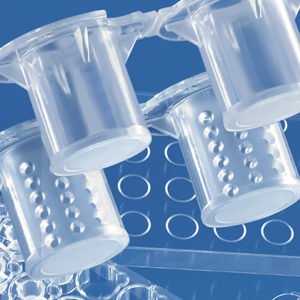 The system consists of two types of cell culture plates and a selection of cell culture inserts. The standard model is used in such applications as co-culture, migration/invasion assays, and chemotaxis assays, and the specialized model is well-suited for the automated in vitro preparation of human tissues (3D tissue culture). Key features to consider when selecting which components to use are plate selection and well size, insert type, and membrane pore size and material. The cell culture plates are available as a standard 24-well or a specialized 6-well plate. Each plate can be fitted with an individualized set of inserts. All plates have guide ridges for perfect insert fit and specially designed feeding ports for easy media changes and use with robotic equipment. The plates are manufactured according to the requirements in ANSI/SLAS Standards 1 and 4, and are supplied with lids with condensation rings. The standard 24-well plate includes 24 individually fillable wells that can be fitted with strips of 4 inserts and/or individual inserts. Each well has a guide grooves to center and hold the insert in place. This prevents the individual inserts from rotating - the feed ports on the wells remain open. Suited for basic applications such as co-culture, secretion studies, migration studies. The specialized 6-well plate has 6 rows of 4 wells connected as one large, elongated well. This well is fitted with a strip of 4 inserts so that all 4 of the inserts in the strip can be supplied with medium at the same time. Particularly well-suited to the use of insert strips with inlet channels (IOS). Suited for in vitro preparation of tissue (3D tissue culture). BRANDplates® 24-well standard plate - Pack of 10 plates (Individually wrapped with lid). BRANDplates® 6-well specialized plate - Pack of 10 plates (Individually wrapped with lid).